From now until September we will be raising funds for our Education Fund which supports people in the asylum process onto further education. Our main event will be in June and we are delighted to have over 70 women joining us for it. 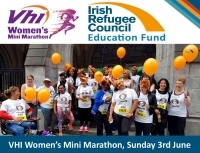 We also invite you to join us for the VHI Women’s Mini Marathon! Last year, we were able to financially support 53 people to access further education through our Education Fund and with your help we can build on that this year. You can register for the marathon via www.vhiwomensminimarathon.ie. Alternatively you can setup a fundraising page via Facebook and 100% of what you raise will be donated to us for the Fund. Find out more about our Education Access work. Contact [email protected] to let us know that you are joining the IRC team this year!